"Your modern. Fresh. Funny. ...I like you!" The show is a roller coaster ride of side splitting Comedy, strong Magic, Mind-reading and Fun. Alternatively to his Close Up Magic, Andy can offer a stage performance. His Comedy Magic Stand Up Show is full with high impact magic and laughs. The show is flexible to your event timings ( 7mins - 50mins ) to create a hi impact, energiser for any event. Also custom script can be created to get a brand message across in a magical and MEMORABLE way! Usually placed at the end of the meal before the speeches, this works well as it "Warms" the audience, getting them laughing and applauding before the speeches start - which makes it easier for the first speaker, warming the audience first! Lasting 25 - 45 minutes ( Depending on your requirement ). Plus it adds something completely different to your wedding. A glass bottle will vanish at Andy's finger tips, right in front of your eyes. Andy will disappear a persons signed 10/20euro note and have it re appear INSIDE a lemon! A table will even FLY across the room! ...LITERALLY..! Cork Institute of Technology ( CIT ) to over 500 Students! 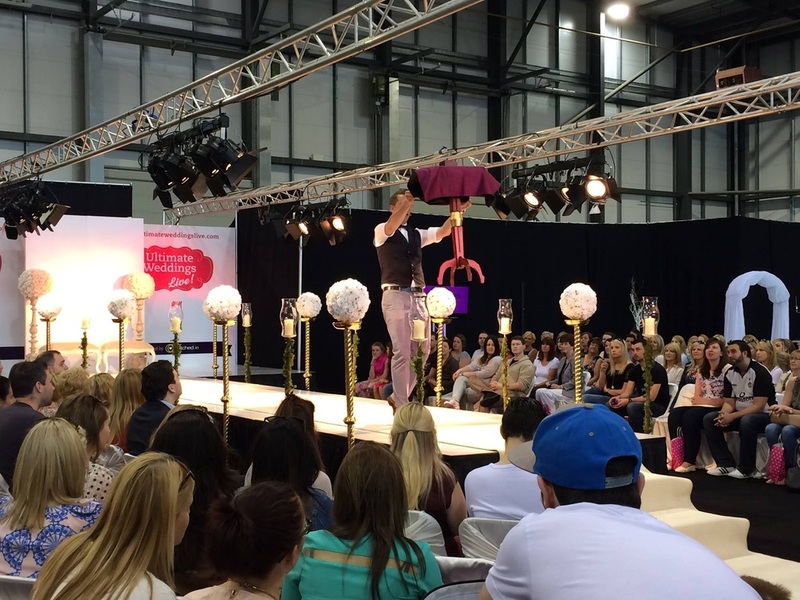 Andy performing at the Ultimate Weddings LIVE Show - in association with "Weddings by Franc".